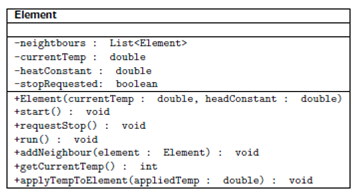 currentTemp += (appliedTemp - currentTemp) _ heatConstant. Because neighbour elements are running in their own threads and accessing each others temperature, careful synchronization will be needed whenever the temperature field is accessed or changed. Using the UML diagram below as a guide. Graph, explain the prims''s algorithm with suitable example? explain the prims''s algorithm with suitable example?